Plan an island getaway and go to Jamaica to feel the reggae rhythms of the exotic country on a great vacation. No hotel in mind? Do not worry, we have a solution for you. 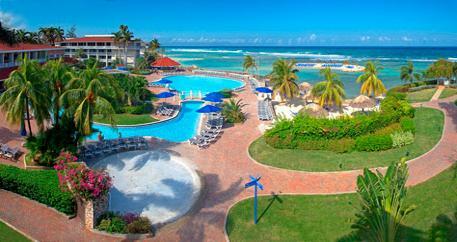 Go to Montego Bay and stay in an upscale hotel beginning at $72 per night per person . Check out the details on Travel Ticker. Travel through December 22, stay on the beachfront in Holiday Inn SunSpree Restort in Montego Bay, Jamaica and benefit from a lot of extras: 2 of your your kids stay, eat and play free in the hotel (children under 12), you get 10.000 Priority Club bonus points – in case of a minimum 5 nights stay – and free in-room Wi-Fi. The offer includes – apart from the room accommodation of your choice – all your snacks and meals, daily activities and nightly entertainment as well as a wide number of non-motorized water sports. You can save 65% off of regular prices, but to get the discount, you have to hurry up because the offer ends soon. The hotel has got its own private beach with crystal clear water and white sand. 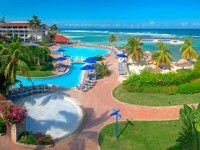 The resort also features two pools, five restaurants and four bars. Your room will also have a balcony and all that from only $72 – including all taxes and gratuities. If you had enough of beach and sun and would like to see more of the Jamaican life, downtown Montego Bay is only 10 miles from the hotel, you can take a look. This entry was posted on Thursday, September 1st, 2011 at 6:12 am and is filed under Hotel Deals. You can follow any responses to this entry through the RSS 2.0 feed. You can leave a response, or trackback from your own site.